Shea Butter is able to be absorbed quickly into the skin and is excellent for dry skin, stretch marks, cracked heels, peeling (due to sunburn) and evening skin tone. It has been proven clinically to prevent not only stretch marks but to have anti aging properties and is able to promote the healing of burns while minimizing any scarring. 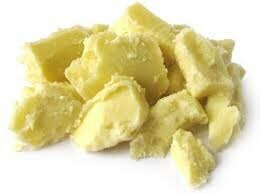 Shea Butter is also used to relieve aching muscles and to treat rheumatism. Ideal ingredient to use in many cosmetic and pharmaceutical products such as soap, body butters, lotions, salves etc...It can be used in high proportions without fear of causing an allergic reaction and is an easy ingredient to add to many types of emulsions. It also makes a great carrier as it actually helps to prevent allergenic reactions without altering the active principles of the product it is added to. Odor: Due to the refining process it is deodorized and has little to no odor Shelf Life: 1-2 years when stored at room temperature out of direct light. Shipping is based on weight, size and destination of item. We ship USPS unless otherwise stated. Anything that is under 13 ounces we ship first class (keep in mind the packaging is also included in that total), we always try to use a priority flat rate box when it is possible and when neither of those are applicable we ship regular priority. We will always refund any shipping overcharge greater than $1.00. Generally purchasing more than one item at a time adds even more value. We will be carrying all of the supplies for candle and soap making, I am in the process of getting them listed. If you are interested in something that you do not see please contact us, most likely we carry it, and I will then get it listed promptly for you. Wonderful, thank you for the quick shipping and treat! Very nice and soft Shea butter. No odor and glides on very smoothly. Customer service is terrific and shipping was fast. Product was packaged and sealed very well with no leaks. Awesome! I highly recommend this shopping.